Managing VMware with PowerShell featured on RunAs Radio. For those who may not know, RunAs Radio is a great online Audio Talk Show hosted by Richard Campbell and Greg Hughes, and focused on Windows administration. Recently at TechEd, Hal Rottenberg managed to get us both an interview with them. That interview is now posted as their episode "Using PowerShell with VMware". 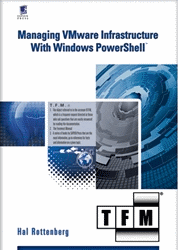 Check it out, and don’t forget that Hal is soon to be an internationally famous and critically acclaimed author of a book called "Managing VMware with Windows PowerShell". Hurry up with that book already, Hal! This entry was posted in Uncategorized on July 2, 2008 by Carter Shanklin.